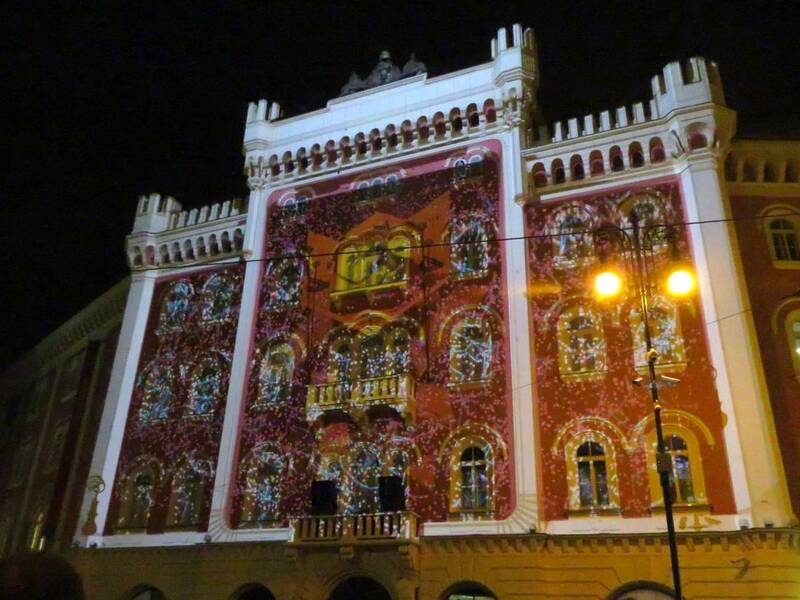 A plague-era gravedigger, a flaming man and a harlot wander the same area of Prague. Gambling can have dire consequences. Nobody knows that better than the former gravedigger of the St Peter’s Church at Na Poříčí in Prague’s New Town area. He served there during one of the plagues that ravaged Prague hundreds of years ago. When you see him, he can tell you his story, but take our advice and run instead. The church is actually a street over from Na Poříčí, as its once vast churchyard has shrunk to a tiny patch of grass. The gravedigger was an avid card player and had a circle of friends from the church congregation who would come to the local pub to play a form of euchre that was popular at the time. As the plague raged on, his friends dwindled and the pub grew empty. Eventually, all of his friends were in the church’s crypt waiting to be buried once a new mass grave was dug. But instead of getting to work with his shovel, he sat his dead friends around a table and said offhandedly that he wished his friends could come back to life for just one more game. … In fact, he would give his soul for just one more game. The bell tower was added later. A demonic spirit was on the lookout to make some extra benefit from the plague and obliged the wish. The gravedigger’s friends opened their eyes and were ready to play. The crowd was rather boisterous, singing bawdy songs and telling crude jokes filled with foul language, despite being in a church. The cards changed hands until midnight, when suddenly all the dead again lost their animation and fell to the ground with an ominous thud. 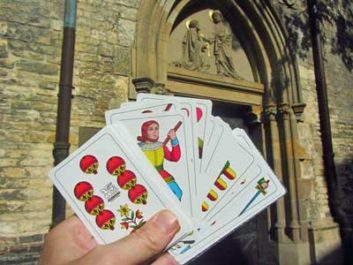 Cards for playing Mariaš, at the main entrance of the church. The gravedigger found himself face to face with the smiling demon, who cursed him to roam the area of the church forevermore until someone beats him at cards. To this day legend says he can be seen near the church dressed in shabby and muddy old-fashioned clothes, speckled with quicklime from the graves he dug. He holds out a deck of cards to passersby and tries to bid them to join him in a game. He can be freed if he is beaten at the game, but if the opponent loses the stakes are high. The demon claims yet another soul. Willing players are few and far between. It would be easy for the gravedigger to free himself by throwing a game, but he is too good a gambler to ever do that. His tale is not the only ghost legend for the Na Poříčí Street area. A fiery man is also supposed to roam the locale, but he hasn’t been seen for a while and may have been freed. The fiery apparition scared people and nobody ever approached him. He had been wandering at night covered in flames for 300 years because he had been so rude and had such a hot temper in his lifetime. The centuries had mellowed him though, but he was bored and lonely. He could never find out what was going on in the world because whenever he touched a newspaper he found on the street it would burst into flame before he could finish the headlines. One day a rather drunken man approached him and struck up a conversation. The fiery man declined the invitation for a beer, as it might interfere with his flames. The man then left him, but not before offhandedly saying “God bless you and good night.” The kind words of a stranger were all that was needed to break the spell. The alternate version is that the fiery spirit grew invisible once modern street lighting was installed. So while unseen, he still wanders. The area is actually crowded with even another ghost, if all the legends are to be believed. A harlot named Stáza from the once-rich silver mining town of Kutná Hora used to stand under a gas lamp on busy Na Poříčí. She was shy and sweet, and slightly chubby as was the fashion of the time. Her clients knew her as Soňa. The police, colloquially called plumes at the time due to their feathered hats, usually tolerated the ladies of the night, but a municipal election was coming up and there was a morality campaign to clean the streets. She did not want to be arrested and sent home in disgrace to her strict father, a cobbler with a leather strap. 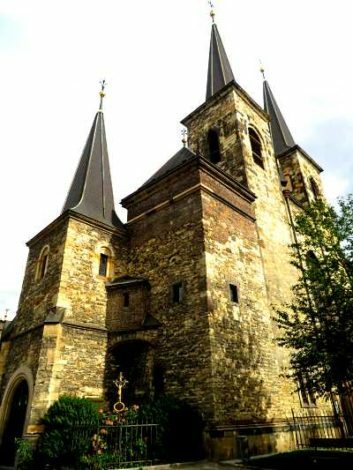 So she ran toward St Peter’s Church and got as far as a side street called Biskupský dvůr where an over-enthusiastic police dog caught her and ripped her to shreds. 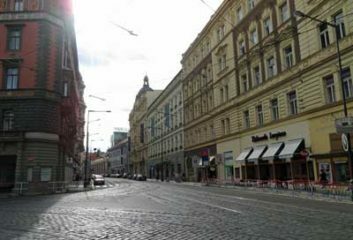 Na Poříčí Street in the afternoon. She still wanders the area, dressed in clothing that long ago was considered lewd and revealing but by modern Czech standards is rather conservative. 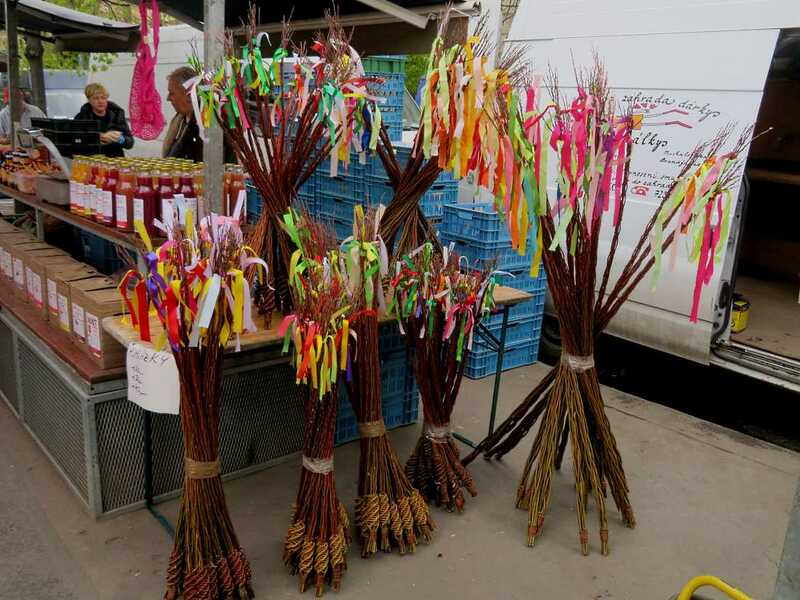 She can be freed if a policeman — no feather required — approaches her and tells her that she will be let off with a warning and won’t have to face a court hearing and won’t be sent home to Kutná Hora in disgrace. But with her outfit — compared to the yoga pants, cutoff shorts and skimpy tanktops worn by even nice girls of today — no policeman ever thinks that she might be trying to solicit. So it is unlikely any warning will come soon, and she will continue to stand and wait. The final legend for Na Poříčí is that there is a lost treasure buried in a coffin somewhere in St Peter’s Church or its grounds and a yellow fairy light sometimes appears above it. The cemetery has long been abolished, and no fortune was ever found as new buildings rose up. Perhaps it is in a vault in the crypt to this day, but as the crypt is never open the odds of finding it are slim. St Peter’s Church at Na Poříčí Street has a history going back to at least 1178, when a smaller church stood on the same site. The current building dates from the 14th and 15th centuries. 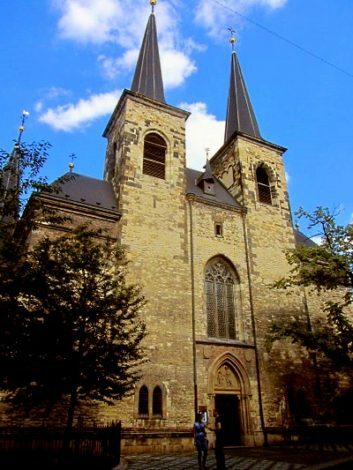 It began as Romanesque structure, was changed to Gothic and later to Baroque. In the late 19th century by Josef Mocker, one of the architects who also completed St Vitus’ Cathedral, returned it to the Gothic style. A final renovation took place in 1913–14. 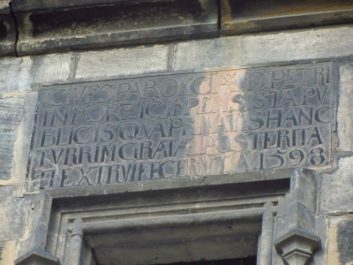 The church was affected by widespread fires in 1653 and 1659. 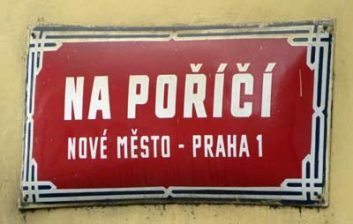 Sign on the bell tower. 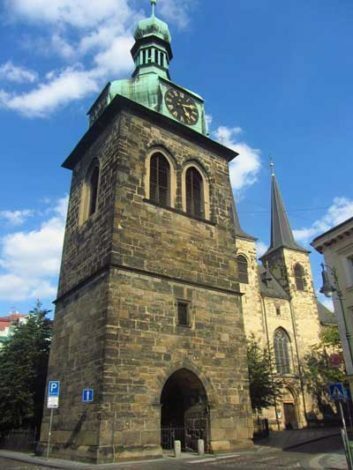 The detached belfry, with three bells, has a stone with a Latin inscription saying: “The Commoners of St Peter’s Church at Poříčí built this tower at their own expense and for their grateful descendants in 1598.” The top of this belfry has an onion dome and with four clocks. Mariáš is one of several trick-taking card games played with a 32-card stripped or shortened deck that is popular in Central Europe. The suits also differ from those in a 52-card deck. It is related to euchre. An image from a Mariáš deck can be seen on the Two of Pentacles in The Tarot of Prague deck. Plagues were quite common in European cities due to poor sanitation. 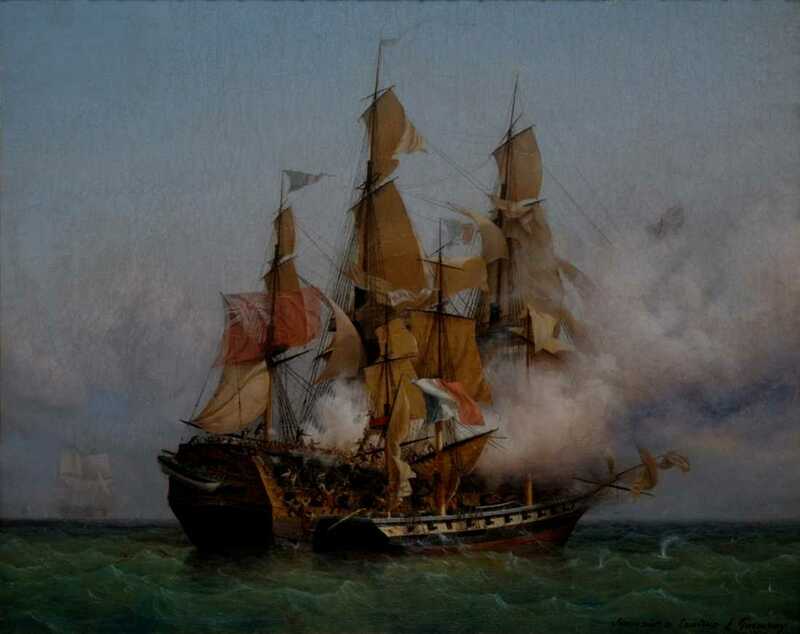 Aside from the Black Death, there were constant outbreaks of cholera and typhus. So finding a date for any story that vaguely refers to plague is rather difficult without further information. After each plague subsided, people across Central Europe would erect a plague column, giving thanks for the end of the epidemic and begging whatever powers exist in Heaven that there should not be another one. The most famous column in the Czech Republic is in Olomouc in the center of Moravia. It was erected in 1714–16. The column, but not the rest of the city or even the town square, is a UNESCO World Heritage Site. 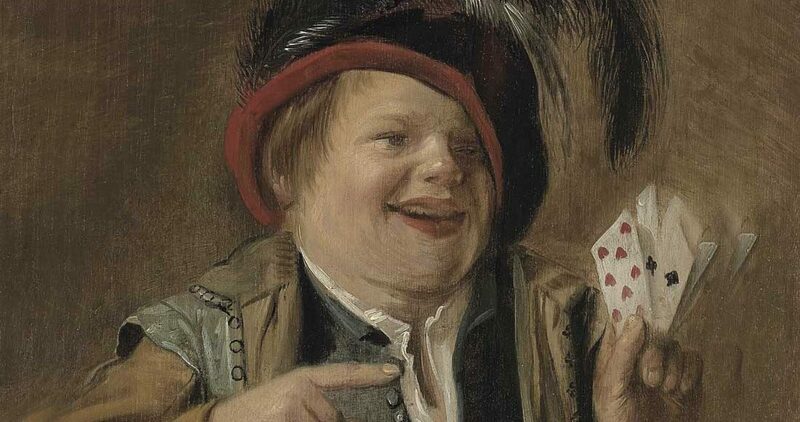 Main image: A card player by Judith Jans Leyster (1609-1660), public domain, Wikimedia Commons. 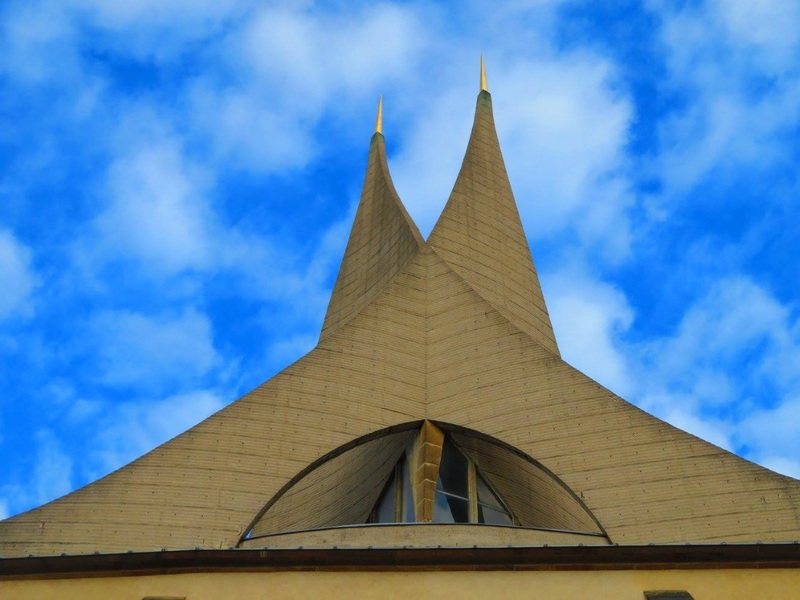 The seven creepiest relics in Prague churches.